Coloring #2. Feel free to leave critique- it's always helpful. I like it. Makes the scene look pretty gritty, almost like it takes place underground. 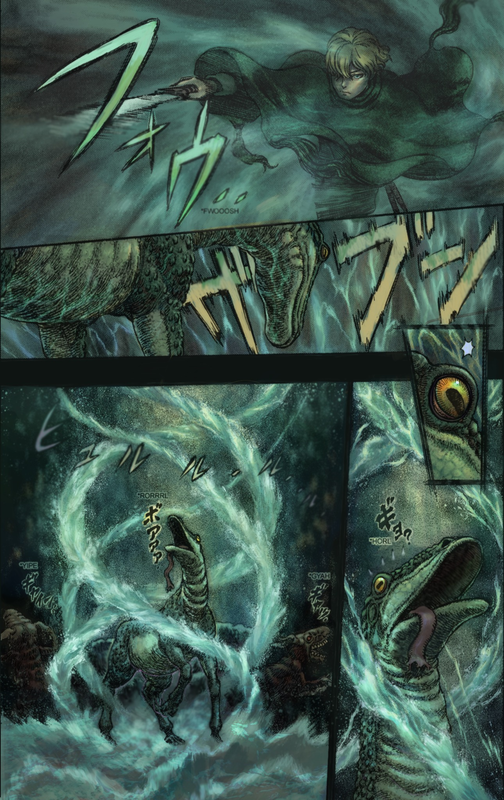 I get the sense it's taking place under water almost, which is pretty appropriate given the Kelpie's abilities. Perhaps trying increasing the brightness/white levels? It's extremely well done though. Very cool! Most coloring jobs just kind of fill in the space between the lines, which tends to make liquids, gasses, or anything that doesn't have a defined outline look weird, but you blended it all together in a way that looks like this page was always meant to be in color. This is crazy beautiful! I like it a lot. Good work! Really nice! I like your water brushes, the look fits perfectly.